Chatimals could very well be the next best thing your household could have if your little one seems to be the chatterbox in the family. You will be able to choose from a dinky looking hamster or a meerkat friend depending on your taste, where it is smart enough to retain whatever you say to it, repeating incessantly in a slightly patronizing voice. Want them to speak up? Just give their tiny paws a gentle squeeze and you’re good to go, where anything they hear will be spoken back to you. Of course, it might just keep your toddler who is now learning to speak quiet, but that remains to be seen as he/she might just get frustrated at the Chatimal in question, ripping out an arm or a leg in desperation to be the resident top dog where the chatterbox category is concerned. 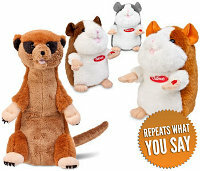 You can choose from either grey, beige or ginger shades for the hamster, while the meerkat has only one color – brown. At £19.99 each, they’re certainly worth checking out if you want to purchase a toy for your little one.